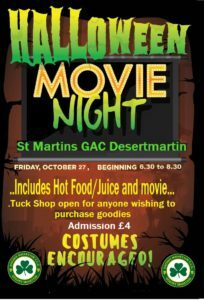 There will be a Halloween Movie night in the hall on Friday 27th October form 6:30pm. The big screen is waiting to go. The movie will be child friendly, and costumes are encouraged. Admission is £4 and there will be hot food, and tuck shop opened.